"We believe that these memoirs could well become the most successful memoir ever," said Thomas Rabe, chief executive of the German firm. Mr Obama's book is yet to be published. Nielsen - which tracks UK book sales - said Michelle Obama's book was currently 11th on its list of top 20 bestselling biographies and memoirs, which tracks sales since official records began in the late nineties. Michelle Obama's book, which explores her experience from childhood, her work, motherhood and her time in The White House, has been praised for its universal appeal across genders and ages. The 54-year-old also criticises the current US President, Donald Trump, writing that she can "never forgive" him for "putting my family's safety at risk" over his championing of the "birther" theory that her husband was not born in the US and thus was not a legitimate president of the US. 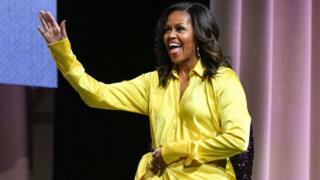 Video Michelle Obama: What's behind the former first lady's appeal?